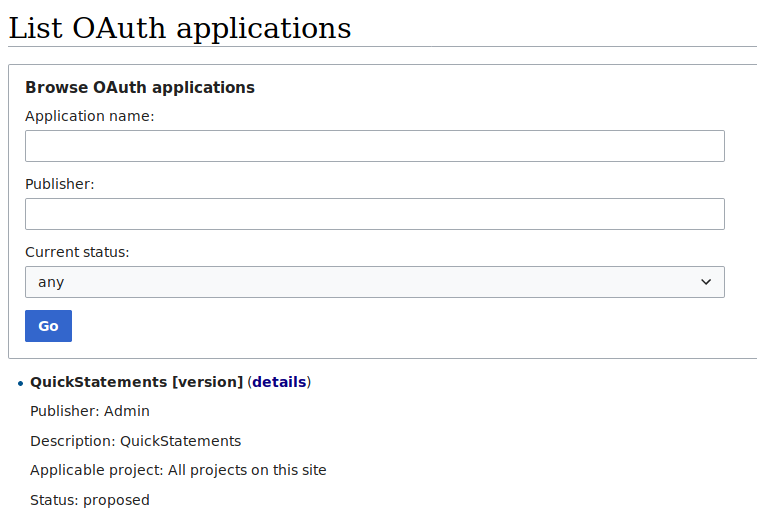 We should have quickstatements working as it does on wikidata.org out of the box. 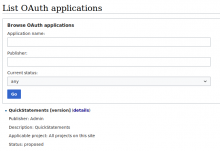 Quickstatements OAuth should require no user interaction by the Admin user to setup. It should behave in the same way as a user visiting the wikidata.org version sees it behave (i.e. each end user still has to approve the consumer to make edits). T215369: Install fails while running updateSearchIndexConfig.php - no such index "mw_cirrus_metastore"
• Addshore merged a task: T205018: Allow bot access to the Quick Statement tool in the Wikibase Docker distribution . • Addshore added a subscriber: thisismattmiller. Related: T200775 which has been closed an T165219 created. Lydia_Pintscher moved this task from Incoming to Needs Work on the Wikidata-Campsite board. @Tarrow @Addshore can you please create the remaining ticket before storytime tomorrow so we can pick this up? Lucas_Werkmeister_WMDE moved this task from Ready to go to Wikidata-Campsite-Iteration-∞ on the Wikidata-Campsite board. Lucas_Werkmeister_WMDE edited projects, added Wikidata-Campsite (Wikidata-Campsite-Iteration-∞); removed Wikidata-Campsite. Tarrow moved this task from To Do to Doing on the Wikidata-Campsite (Wikidata-Campsite-Iteration-∞) board. It's because https://github.com/wikimedia/mediawiki-extensions-OAuth/commit/98df9d78b1fd2a4d96a01b5af7031335ce27e3b8#diff-c040382e76751693f9b9b99cbed94e4e doesn't exist in 1.32 and 1.31. Let me backport. "approved":"Someone changed the attributes of this consumer as you viewed it. Please try again. You may want to check the change log." I will try to see what's going on there and fix it. Okay it seems in the maintaince script we make the context and then set the user and then MWOAuthConsumerSubmitControl::processAction() builds the context again from singleton but doesn't set the user causing the $cmr->checkChangeToken( $context, $this->vals['changeToken'] ) to fail. It's a needed feature to make sure integrity of context is intact so I don't know what to do here. Maybe we need to remove the user from the context. Is this only breaking on a specific version of mediawiki / OAuth? It's broken on 1.32 but I tested it on master on my native installation and it works. Let me go to 1.32 and try again on native installation. Yup, it's broken only on 1.32 both native and docker. 'ownerOnly' key in context is different, it's 0 in one and false in the other. BTW this is related T215369: Install fails while running updateSearchIndexConfig.php - no such index "mw_cirrus_metastore"